La ville a été récemment rénové avec un style moderne et le luxe d'un hôtel cinq étoiles, d'une touche de la maison et spacieux pour un logement de la ville à 2,400sq parfait pour les amis voyagent ensemble ou une famille avec des enfants. Il ya trois étages de la maison et les deux étages supérieurs ont chacun 2 chambres à coucher. Chaque chambre dispose d'un lit queen size et salle de bains carrelage. Vivez comme une célébrité que vous appréciez de nouveaux meubles de marque de luxe, des planchers de bois franc, cuisine complète, grand écran TV, et les draps cinq étoiles. Idéalement situé au centre-ville, à quelques pas du centre des congrès, du Walnut Theatre, de l'hôtel de ville, de China Town et de nombreux sites historiques autour de la ville, facilement accessibles en transports en commun. Le prix est pour 8 personnes et 4 lits si vous avez besoin de linge pour les futons sera 25 $ par ensemble et 25 $ par personne et par jour après 8 personnes. If you want luxury and also being in the heart of the city look no further. The host was very helpful and my stay couldn’t have gone any better. Thank you! Thank you for your business. Glad that you found our facility matches to your need. The location of the townhouse was good for our purposes. One drawback were the overflowing garbage dumpsters lining the street. The unit itself was spacious and accommodated the nine of us well. It could have been set up to be warm and inviting but the really missed this mark. It was not as clean as it should have been, in fact it was kind of dirty. The bedding was old and needed to be replaced. Two of our beds did not have blankets or comforters. We had to use throws to cover up. The towels were well past their useful life.The dishwasher was not operating, nor did the clothes dryer dry towels. No accommodation was offered to compensate for these inconveniences. To the contrary, we were presented with additional charges for using seven beds instead of four. We were also told that the rental "included" one parking spot...included means for an extra $25/day. We encountered and reported ants in the kitchen but were not offered any assistance in dealing with them. The townhouse has a ton of potential and our stay could have been considerably more comfortable with a little cleaning, some nice bedding and some decent towels. In short, put forth an effort to make your guests comfortable. I expected a lot more for the money. We are sorry that you have felt that way about our facilities. The dishwasher was broken due to the prior guess therefore we were not able to replace/fix it due to the quick turn around. The extra beds and parking issues have been communicate with you prior to your arrival. Thank you for your input we will look into the issues. this property worked well for me and my friends who were making a short visit to philadelphia to see the major tourist sites. many of the places we wanted to visit were within a short walk. we did not spend much time in the apartment and did not prepare any meals. mainly we were there to sleep. there was way more capacity than we needed, but since we each like to have our own room, this was a reasonable alternative to four hotel rooms in a similar location. i could easily see this apartment being used for a large family group or a group of couples who have a reason to be in PHL. 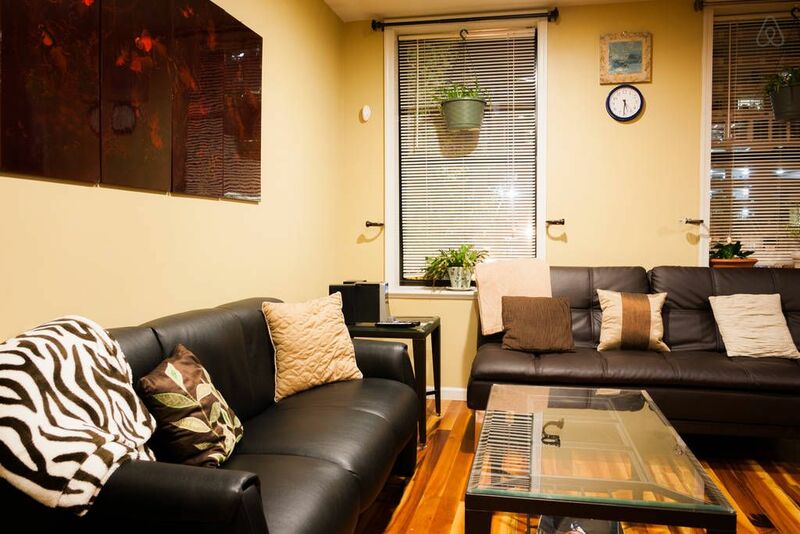 Very clean, spacious apartment right near downtown and in walking distance to Independence Hall, center city and great restaurants. I would highly recommend staying here. Our international guests stayed here for 6 nights and loved the house. It was well-equipped with everything they needed, clean, and conveniently located. The owner was helpful and communicative. We would highly recommend this property. Centre des congrès, l'hôtel de ville, Jefferson Hospital, Pennsylvania Hospital, le carré Ritten House, de nombreux sites historiques, Noyer Theater. This is a strictly no shoes, no pets and no smoking rentals. We do provide house slippers or you welcome to bring your own. There will be fines if these rules are violated. The rate is for 4 beds and 8 people assuming 4 couples and will be using 4 beds. If you need additional beds due to single person there will be a charge of $25 per linen set. If you wish to bring your own you're welcome to. The minimal cost is due from the cleaning company.